The premiership cups in Katherine. 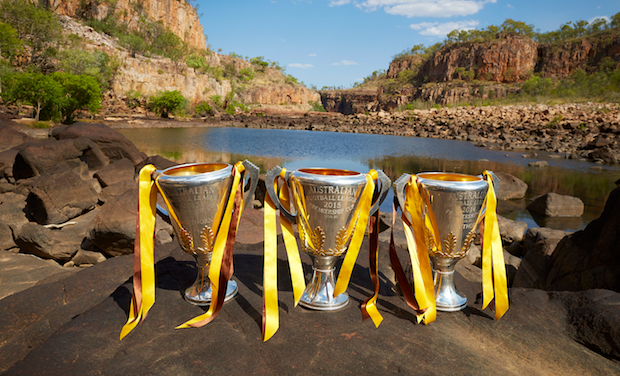 THE community of Katherine in the Northern Territory were recently treated to three special guests – the 2013, 2014 and 2015 premiership cups. Following the club’s visit to Darwin for the fifth leg of the Premiership Cup Tour, the cups were then taken on the 316-kilometre journey to Katherine to visit local schools and support its Indigenous Program. The cups visited every school in town and were greeted with much excitement and awe as the children cherished their chance to grab hold of the famous trophies. Next was a trip to the magnificent Katherine Gorge, where they were greeted by six smiling students from Kalkaringi School (Kalkarindji and Daguragu communities), who had driven over eight hours just to have the chance to hold the cups and ride with them along the stunning waters of the Gorge. Finally, the cups visited Hawthorn’s affiliated club Big River Hawks, (Katherine-based under 18 side in the NTFL), where the cups were proudly put on display as Big River were put to the test at training. Epic Good Foundation co-creator, Stuart Giles and his son Sam, were also guests on the cup tour to Darwin and Katherine. It was a great way to finish an amazing year for passionate Hawks Stuart and Sam. Not only did they witness the three-peat but earlier in the year, Stuart and his wife Cathie Reid announced a $1 million donation over five years towards Hawthorn’s Indigenous Program.